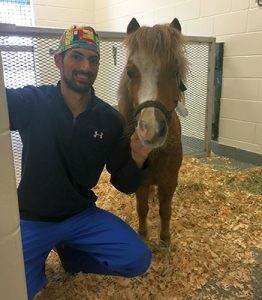 One year after a femoral head ostectomy at the University of Florida Large Animal Hospital was performed on a miniature horse, Rico is thriving and back to his normal routine. Although it was unclear what had caused Rico’s injury, trauma of some kind was suspected, Dr. McCarrel said. “The only horse that might have a surgical option would be a mini, so he had an opportunity that another horse might not have had, as surgery would just be too difficult,” Dr. Miller said. A larger horse’s weight would make even obtaining a diagnosis problematic, but she was able to get “pretty good” images of Rico’s leg, she said, aiding in his diagnosis. McCarrel researched her approach, delving into the small animal literature and limited equine literature to prepare for a femoral head ostectomy in Rico. The procedure is a well-known surgical option in certain circumstances in dogs with hip dysplasia or a dislocated hip that will not stay in the socket on its own, similar to Rico’s case. However, femoral head ostectomies are seldom performed in horses. “He’s just my little angel,” she said.